I find with project bathroom, some months it's a real struggle to get through anything, and other times everything seems to finish at once. This was definitely one of those months, but despite that, I would actually repurchase most of the items listed above. Special mentions go to the Liz Earle exfoliator, which felt super gentle yet effective, and the Benefit mascara, which really did help to lenghen and volumise. I was also sad to finish the Alpha H cleansing oil and Molton Brown shower gel, both of which are now on my Christmas wish list. Of the 17 items, there were only 3 that I didn't like. I wasn't keen on the scent of the Burts Bees body lotion, although it was very nourishing and did a good job of keeping my legs moisturised. The Alberto Balsam shampoo was completely wrong for my hair type and I found the fragrance rather sickly. Finally I thought the Lush conditioner was too watery, and once again, the smell was really off putting. How are you getting on with project bathroom?What will you be putting on your Christmas wishlist? 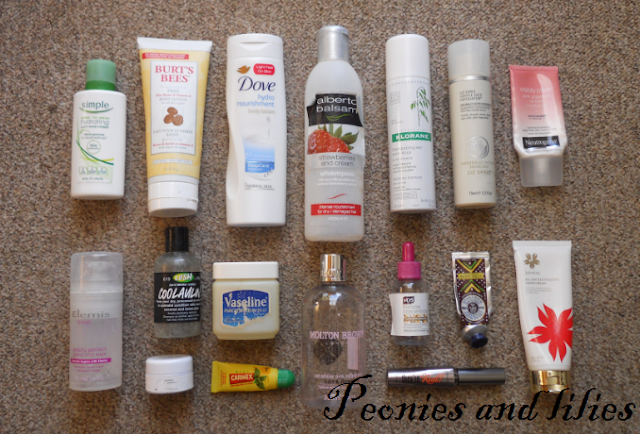 I love these empties posts :) its always a bit sad when you finish a product you love ! Is the Alpha H Cleansing Oil a new product or have I just missed the memo about it? My empty pile looks the same this month I've got through loads of shower gels!